> I’ve been following the Dim Sum truck on twitter for a while now and because I am hardly up in LA, it’s been a bit of a drag trying to sample some of these LA food truck offerings. One morning, when I was headed up LA way, I noticed that the Dim Sum truck was going to be parked near where my friend and I were going and so I insisted on chasing it down foregoing our previous plans for lunch. This friend of mine is not a foodie and is never too excited with my obvious obsession with food, but is highly compliant when it comes to appeasing me with my various food whims so it was no surprise that there was no objection to driving while I tried to give directions. I say “try” because the first attempt took us to an address in Venice which was non-existent, and after three drive bys, my friend, in a very gentle and patient voice asked me if there was a number I could call to check the the truck’s whereabouts. I decided to double check on my twitter page and realized that we should’ve been in Santa Monica instead of Venice. I looked at my friend apologetically and murmured that I had made a mistake and my sweet dear friend, without chastising me, drove towards Santa Monica not once making me feel bad about my obvious challenges with giving directions. When we found it, I was happy to see that there wasn’t a line, but what was even more surprising was that there were two other food trucks parked within steps of each other (but that’s another review). We found a spot right behind the Dim Sum truck and I stood in line — behind only one person — and decided on the Peking duck taco, har gow (shrimp dumplings), siu mai (pork and shrimp dumplings) and ham sui gok (dried shrimp fried mochi dumplings). The order probably took about 5-7 minutes, not long at all, and when I opened the box, my eyes honed in directly onto the Peking duck taco (pictured right). Of course, I wouldn’t allow my friend to touch the food until I’ve taken a few shots with my camera — which anyone who is friends with me is, or soon enough will become, accustomed to. After I got the shots needed, I immediately grabbed the taco and took a bite out of it. I actually really liked this! The duck was strong and gamey, the hoisin sauce was enough to give it flavor but not overly powerful as to mask the duck. The julienned cucumbers were a great accompaniment as well. 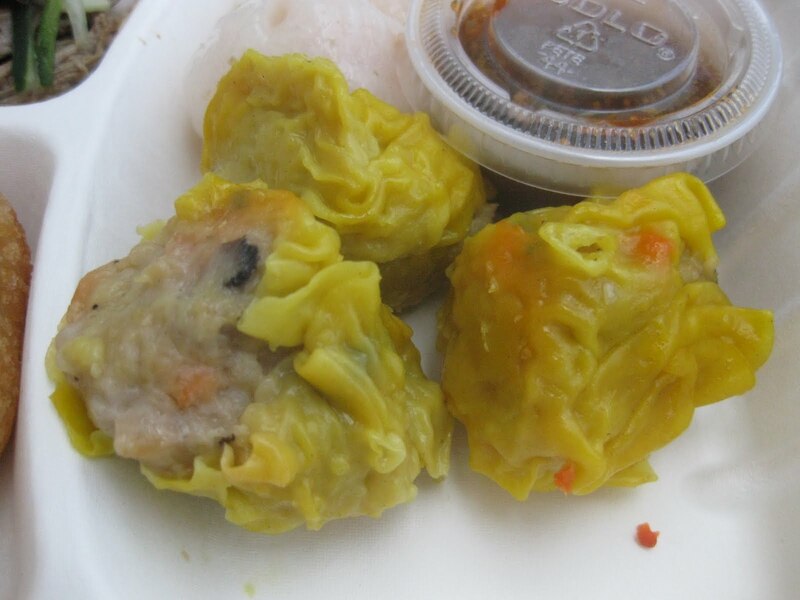 I’m ordinarily not a siu mai (pictured below left) kinda gal, but I must say, these were some of the better ones I’ve had. Unfortunately, I couldn’t say the same for the har gow which were encased in a very thick wrapper — at least they used a decent amount of shrimp in it. The accompaying dipping sauce was a simple soy and sesame oil, nothing too exciting. What were even worse than the har gow were the ham sui gok as these aren’t meant to be fried and then reheated and eaten later. These have to be eaten fresh! They were super greasy and when I bit into one, the oil just seeped out and ran down the side of my mouth. This was an awfully disgusting experience! Note to self: if a fried item isn’t fried to order, stay away! I ended up getting an extra order of Peking duck taco so my friend could taste it — since I had wolfed down the first one without a fleeting thought that my poor friend hadn’t even gotten a taste yet — but the second taco was laying in a pool of grease and was highly uninspiring when compared to the first. My friend unfortunately didn’t care for it at all. At the end of the day, the Dim Sum truck is an excellent concept of bringing dim sum to the masses, but standing on the roadside eating dim sum out of a styrofoam box somehow completely takes away from the whole dim sum experience. If I saw the truck somewhere and I was craving dim sum, I would definitely stop and grab a couple of things, but to chase it down especially when I live in Orange County? Thanks but no thanks. It wasn’t THAT good. >LOL your friend sounds like a trooper! But yeah, that sounds pretty gross if they're frying and reheating the ham sui gok. I have been craving some really good dim sum lately and too bad there aren't too many options in OC. >well you know my friend who has to put up with all of my photo taking and food chasing ways!